At first, the values appear to be normal monetary values, but on closer inspection we see that the value 131.58 is actually 131.58000000000001. In excel this would amount to nothing more than a harmless rounding error, but in Power Query this can cause undesired results. 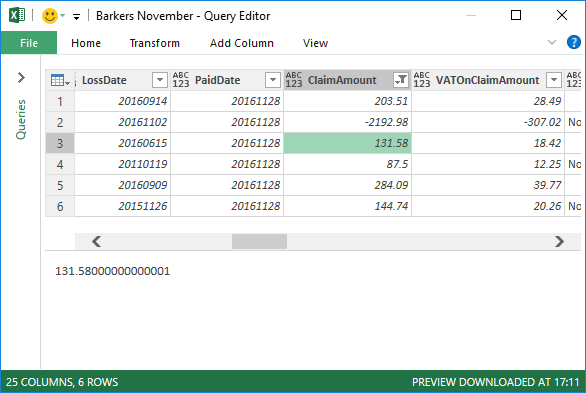 Notice the type hint at the left side of the ClaimAmount column heading - it shows that Power Query is treating the column as the any type. Period denotes a decimal place. The resulting value is what we expected. Yay. Period denotes a thousands separator. The resulting value is in the trillions. Thankfully, the solution is fairly simple: Specify a locale during column conversion operations. ... and voila! Conversions treat the period as a decimal point, not a thousands separator.